Politics is increasingly characterised as "us" versus "them". 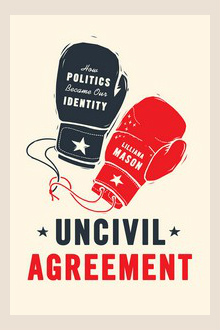 In her book Uncivil Agreement, Lilliana Mason uses social identity theory to analyse and understand the growing political polarisation in America. She argues changing social identities are changing the nature of politics and political discourse. Humans naturally form into social groups which generally promote social cohesion and help us understand our place in the world. However, these social groups also categorise people and create boundaries between groups. People are often members of multiple, cross-cutting groups, and we each have multiple social identities. Thus you might be a Democrat, a member of the church, Hispanic etc. What Mason argues is that these social identities are increasingly overlapping and aligning. Social identities are becoming more homogenous and each political party is becoming in turn increasingly socially homogenous or socially sorted. There is an alignment of partisan, religious, racial and ideological identities and there are less cross-cutting identities. Social identity matters as "people's ties to various groups help to structure their political thinking." (Kinder 1982). In essence Mason believes social identities translate into political ones when the group expresses political demands. This social sorting and social identity alignment is important because of the way groups work as revealed by social identity theory. Experiments consistently reveal that people think of their groups as better than others and there is in-group bias and prejudice. In the 1960s Billig and Taijfel tried to design an experiment that generated no discrimination between groups but couldn't find one. Simply creating two random groups created an ingroup bias and prejudice in behaviour. More than in-group bias they found a desire for one group to win over the other, even if it meant a less favourable outcome for everyone. In one experiment people were randomly allocated to groups. After being informed about the group they were in, they were then asked to allocate money to others identified by only a number and a group name. They could either allocate everyone the same sum or give more money to members of their group than the other group but in this case the sum had to be less than if everyone was allocated the same amount of money. Consistently people choose to give more money to their group members even though this meant they received less money than if they distributed the money evenly. Mason points to research that political partisans prefer to live in homogenous neighbourhoods with members of their own party, and are less satisfied if members of the opposing party live in the neighbourhood (Hui 2013). According to Garner and Palmer (2011) american neighbourhoods are "increasingly balkanised by political attitudes ..as well as race, education and income." Mason also quotes numerous studies that point to growing polarisation. For example, Abramowitz & Saunders 2008 finding that US citizens have become more ideological, Pew Research's 2016 finding that the majority of Democrats and Republicans hold very unfavourable views of the other and Lyengar et al's 2012 finding that their attitudes towards each other are more extreme. They also found 52 per cent said they would not marry someone from the opposite party and 50 per cent of Republicans said they would be somewhat or very unhappy if their child married someone from the opposite party. Mason notes ironically that partisan homogenisation means "politics and religion may be increasingly acceptable topics at a dinner party today, because most of our dinner parties include mainly socially and politically similar people." This social separation Mason argues explains how Republicans and Democrats have grown increasingly distant from one another even when their policy disagreements are not profound. In simple terms social identity alignment "has degraded the cross-cutting social ties that once allowed for partisan compromise" and "political battles become social and cultural battles." The danger is that victory for your group can become more important than achieving policy outcomes, it is about making sure the other side don't win even if it might be damaging to the country as a whole. The way people vote is not by weighing up policy positions and assessing the impact on their lives. "Decades of social-scientific evidence show that voting behaviour is primarily a product of inherited partisan loyalties, social identities and symbolic attachments." (Achen and Bartels 2016) Thus group social identity overrides policy positions and Mason shows that people will adjust their own policy positions if their Party adjusts its position. When two groups are in a zero-sum competition as in politics, they treat each other with bias and even prejudice. Those who identify with a social group are more likely to take action to defend it. Group members feel emotions on behalf of the group. Thus social polarisation creates an increasingly intense and emotional conflict between two groups whose members are more likely to participate in politics. These participants though are more prone to stereotyping, prejudice and emotional volatility. As political parties grow more socially homogenous, "their members are quicker to anger and tend toward intolerance." Members can also dehumanise or demonise members of the other group. Mason argues this increasing group partisanship has done more harm than good to American democracy. When John McCain accused John Kerry of being less trustworthy than the leaders of Iran, President Obama responded by saying it showed "the degree to which partisanship has crossed all boundaries. It needs to stop." However, under Trump partisanship has increased rather than decreased. In 1994 Newt Gingrich sent members of the Republican Party a memo on language and recommended the types of words members should use when describing Democrats. These included betray, bizarre, decay, destroy, devour, greed, lie, pathetic, radical, selfish, shame, sick, steal and traitors. This polarising language, and worse, is still used today. Social sorting and alignment appears to lead to more political activism, which could be seen as a good thing after previous worries about political apathy and non-participation. However, Mason points out that such activism may not be desirable, if it means the most active participants are those who cannot be convinced to change their minds or even listen to the other side. The social makeup of the two parties has consequence for American politics, Mason argues that when parties are divided people react emotionally to political messaging. The move from cross-cutting identities to more homogenous social identities means the electorate is more angry, excitable, and active. Mason argues this is unlikely to produce positive outcomes. "As long as a social divide is maintained between the parties, the electorate will behave more like a pair of warring tribes than like the people of single nation, caring for their shared future." Mason does suggest ways that in-group prejudice can be mitigated such as avoiding negative stereotyping of groups in the media and presenting opposing people in more sympathetic ways. More deliberative democracy may also allow for rational discourse in the absence of cross-cutting social identities. It has to be said though that Mason's book does not provide an optimistic picture of human behaviour when there is increasing social group homogeneity and alignment.